Pomona went 0-6 in non-league play and it looked like the Red Devils Miramonte League reign was in definite jeopardy. Coach Keith Richardson’s team has rebounded quite nicely and it secured a league title last week with a 54-21 win over La Puente. Of course it probably helped that the Miramonte is one of the weaker leagues in the Southern Section. Richardson said much of the early struggles were the result of injuries, with as many as seven starters out at a given time. Most of those players are healthy and ready to go now. He also credits the emergence of sophomore quarterback Daniel Limon. The Red Devil began the season with Ricky Lua at quarterback. He’s a wide receiver but was inserted at quarterback out of necessity. The Red Devils’ non-league schedule was considerably tougher than the league schedule and Richardson didn’t think Limon was quite ready to start against that caliber of competition. But Limon has made great progress since then. Richardson also credits the play of senior lineman Oliver Deerr, one of just two holdovers from the title winning-team of two years ago. Pomona (4-6) has a bye this week to get ready for the playoffs. Richardson expects his team to get top seeded Los Altos in the first round. Chalk that up to the poor overall record and the quality of the league. The playoff draw will be unveiled on Sunday. Pomona made it to the CIF semifinal before losing to Sierra Canyon last fall. The Pomona High School football team is just two years removed from a storybook season that ended with a CIF title. The Red Devils (10-3, 4-0 in Miramonte League) were also pretty good last year, marching all the way to the semifinal before losing to eventual champion Sierra Canyon, 65-26. But this season second-year coach Keith Richardson will have his work cut out for him. The Red Devils return just a few players with significant experience and they start out the season with a game against defending CIF champion in Oak Hills. So they young team is going to have to get better – fast. Richardson was fortunate to get a couple significant transfers with brothers Roy and Robin Wiley coming over from Montclair. Roy, who will play linebacker and wide receiver, was the Daily Bulletin’s All-Inland Valley Newcomer of the Year last year as a sophomore. Last year he tallied 125 tackles, 6 sacks, 2 interceptions, caused 7 fumbles, blocked 2 punts and a field goal. 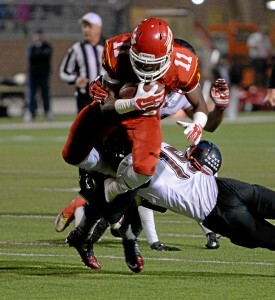 Robin, now a senior, will see time at safety and wide receiver. He had 52 catches for 359 yards and 3 touchdowns last year. Sophomore Mariano Verdusco will be the starting quarterback. He is up from the freshman team. Richardson also singles out senior corner back-wide receiver Nygerron Crouch and sophomore fullback-linebacker Talon Cobb as players off the junior varsity who should contribute greatly. 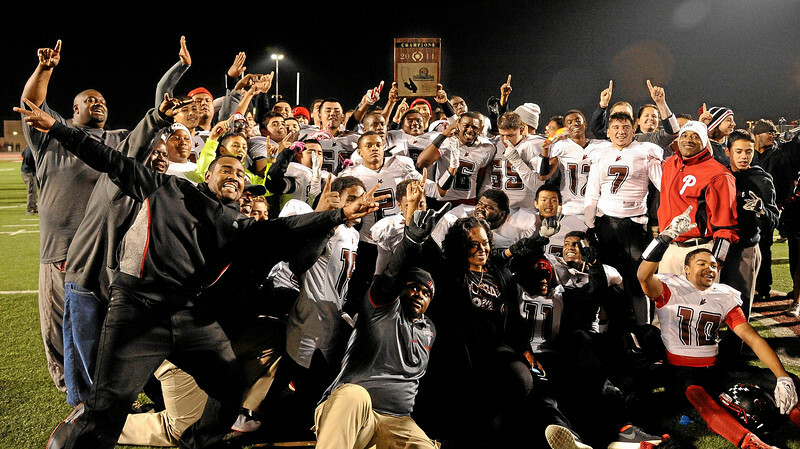 Rebuilding or not, Pomona is capable of repeating as league champion. The Miramonte isn’t one of the tougher leagues by the time league play rolls around Pomona will have played some quality competition. Denario Critton isn’t worried about going to college far from home. 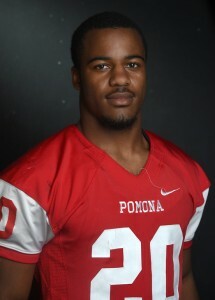 The Pomona High School football standout feels like he’s going through that process right now since he moved from his native Atlanta to live with an uncle here because he thought it would mean better exposure to colleges. Critton, who excelled both as defensive back and wide receiver, has signed with Division 1-AA Northern Colorado after visiting that school earlier this month. Critton said he prefers to play wide receiver. The school is bringing him in to play on the defensive side of the ball and he says he’ll play where the team needs him. Northern Colorado was the only school Critton visited but he had also been talking to San Jose State and San Diego State. He plans to major in business or engineering. Critton held the Red Devils to a 10-3 finish that included a Miramonte League title and a berth in the Mid-Valley Division semifinal where they lost to eventual champion Sierra Canyon. There is very little left up for grabs come Friday night in the Miramonte League. Reigning CIF champion Pomona (7-2, 3-0) is already assured of at least a share of the league title and since it has already beaten Bassett (6-3, 3-1) it has secured the top seeding out of the league as well. Pomona will be finishing the regular season with a home game against La Puente (3-6, 1-2) Friday night. The Red Devils, ranked fourth in the Mid-Valley Division, have won five straight games. Throw out the forfeit win against Garey and Pomona has outscored its last four foe by a cumulative 230-44. It has been ridiculously easy. Ganesha (6-3, 1-2) is the team still on the bubble but with the easiest game left. The Giants have a road game at Garey (1-8, 0-3) and can assure themselves third place with a victory because even if La Puente was to upset Pomona, Ganesha beat La Puente head to head. A third-place team in the five-team league is not guaranteed a playoff berth but Ganesha coach Don Cayer says he has it on good authority that if his team wins it will be in because there are four at-large berths in the division. Ganesha hasn’t made the playoffs since 1997 and hasn’t won six games since the same year. If there is any danger of the Giants looking past their city rival they need to look back only as far as last year when they were in similar situation and lost to Garey 19-7. 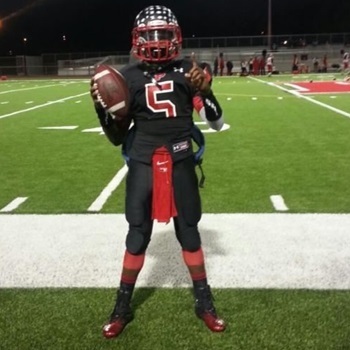 The Pomona High School football team can no longer get away with flying under the radar. Last year the Red Devils won their first CIF title since 1951, capturing the Mid-Valley Championship. So head coach Keith Richardson’s team is now the hunted not the hunter. The Red Devils also graduated 20 or so players, some of them key contributors on both sides of the ball so their loss is even more costly. The pressure is, no doubt, on. The Red Devils (11-4 last year) did inherit a couple of transfers who will be counted on heavily. One of those is senior quarterback Aaron Sandoval who came over from Chino Hills and will be the starter. Sandoval’s arrival will allow Darreon Lockett, to slide over to a receiver slot for which he is better suited. Lockett will also see time on defense. The other big new arrival is senior Chris Jackson, the top player last year at Garey who will also play at wide receiver and defensive back. Other key newcomers are junior wide receiver Ricky Lua, brother of Manny who was a key player on last year’s team, as well as senior Denario Critton who competed in track last year but did not play football. Among the holdovers from the title-winning team are senior linebacker-safety Brian Lamb, senior offensive lineman Christopher Mendez and junior lineman Joel Trujillo. Leonard Hudson is back as offensive coordinator but Richardson will no longer be defensive coordinator so he can oversee the entire game. John Brown, who was on staff, will head the defense. 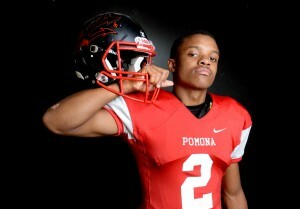 Pomona starts the new season on Aug. 28 at Oak Hills. It begins defense of its Miramonte League title on Oct. 16 against city foe Ganesha. Keith Richardson is expected to be named head football coach at Pomona High School. The move will be finalized at the board meeting on March 5, Pomona Athletic Director Albert Abdou said. “It’s the right thing. He deserved that,” Abdou said. Richardson had been serving as defensive coordinator but took over the reigns when previous coach Aaron Jamieson was put on administrative leave the day before the first playoff game. When Jamieson was ushered out the players were polled to see who they wanted to lead them the rest of the way and Richardson was the choice. He led the Red Devils all the way to the Mid-Valley Division championship and was later named that division’s CIF Coach of the Year. “It’s nice to know I have their trust,” he said. “We’re going to try and keep it going and build on what we did last year. Richardson said he expects little to change. He is keeping the same staff, which includes Leonard Hudson as offensive coordinator. The Red Devils are graduating some key players but have several good ones coming back including junior quarterback Darreon Lockett. Kheenyon Woods makes tackle in title game against Lancaster Paraclete. Pomona High School’s Kheenyon Woods will be signing with New Mexico State next week, Red Devils interim coach Keith Richardson said. Woods was a jack-of-all trades in helping the school to a Mid-Valley Division championship. He caught 12 passes for 287 yards and 6 touchdowns and ran for 440 and five touchdowns on just 34 tries. Shawn Wilson and Andre Walker were a big part of Pomona High School’s run to a Mid-Valley Division CIF championship. Now the two have earned a pretty nice honor in recognition of that. Both have been named to the MaxPreps California Division III All-State team which includes athletes from all over the rather large geographic area. Wilson was named to the “Second Team Offense.” He caught 50 passes for 1,375 yards and 19 touchdowns which help earned him our Inland Valley Offensive Player of the Year honor. Wilson, who has committed to Oregon State, also played full time at defensive back and will probably be playing that position in college. Walker was named to the “Second Team Defense.” He made 183 tackles and tallied 12 sacks. He was the CIF Mid Valley Division Defensive Player of the Year and was also a Daily Bulletin first team All-Inland Valley selection. It seems there is another football coaching opening every week. There are vacancies at Diamond Ranch, Chino, Alta Loma and Claremont with Pomona also trying to decide what to do after its coach Aaron Jamieson was put on administrative leave right before the Red Devils first playoff game. The Pomona position should be a no-brainer. Keith Richardson deserves that position. When Jamieson was told to go away, the players were given the opportunity to vote for who they wanted to lead them the rest of the way. They chose Richardson, who had been the defensive coordinator. That spoke volumes. All Richardson did was steer the team to the Mid-Valley Division championship. You can’t do better than that. Yes the Red Devils had some marvelously talented players, but Richardson kept the team on course when the adversity could have spelled the end to that title hope. Let’s hope the right decision is forthcoming.